DOS Snoopy and Peanuts (USA/Europe) in 09:41.32 by MUGG. 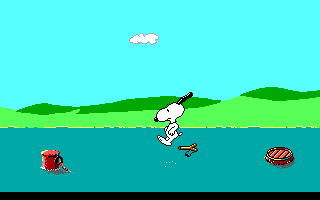 Snoopy and Peanuts, also known as Snoopy: The Cool Computer Game, is a DOS game released in 1989 by Edge Games. You play Snoopy who must find Linus's blanket and bring it to him. MUGG finds the blanket in record time.